Tuesday: Coral Health – Helen Walter, Ph.D.
We started with Breakfast at 7am, and then headed down to the gear shed to grab our gear and get on our boat by 8:15am. Gear loaded we headed off for our first dive at Mandy’s Eel Garden where the students looked for signs of diseased coral. Currently we are learning that many of what are apparently bleached corals are actually not, instead they are diseased. How do you tell? Mostly if you see coral that is only partially damaged it is likely diseased. This is often from wastewater runoff. 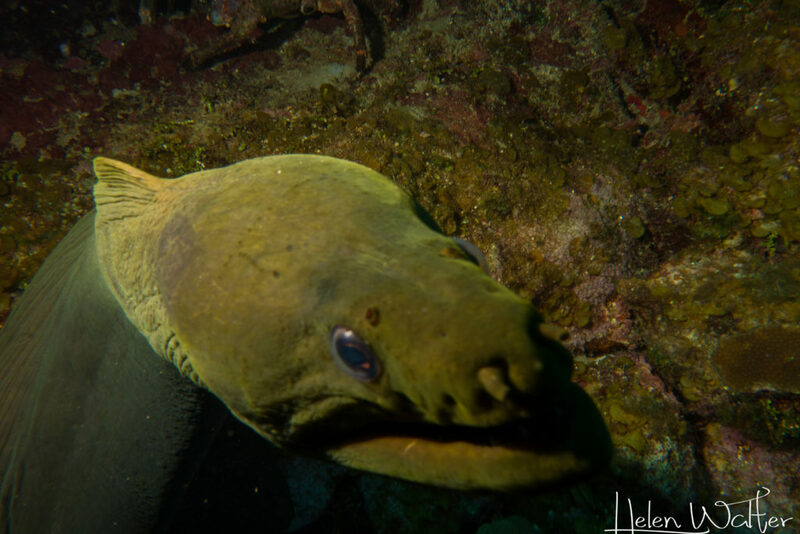 The dive itself started in a sandy area and then moved down to the ‘eel’ garden. Sand eels are fantastic little critters. They are very shy and hundreds of them can be found in one area. We also saw a juvenile spotted drum – these creatures are beautiful, with an interesting body shape. They dart back and forth, so taking photos can be somewhat of a challenge. 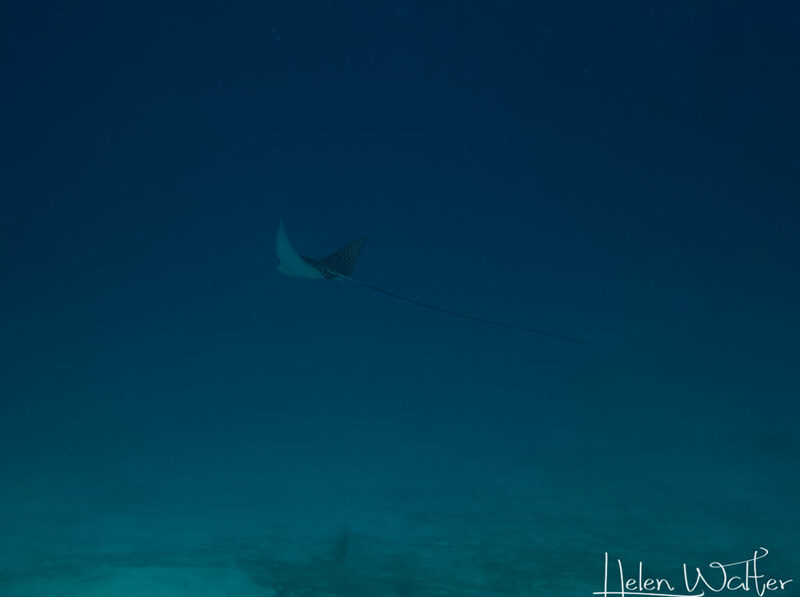 We also saw Spotted Eagle Rays!! Yess!!!! Everyone was very excited. They are such majestic, beautiful creatures that effortlessly swim along. Not close, but still a yay moment in seeing one! 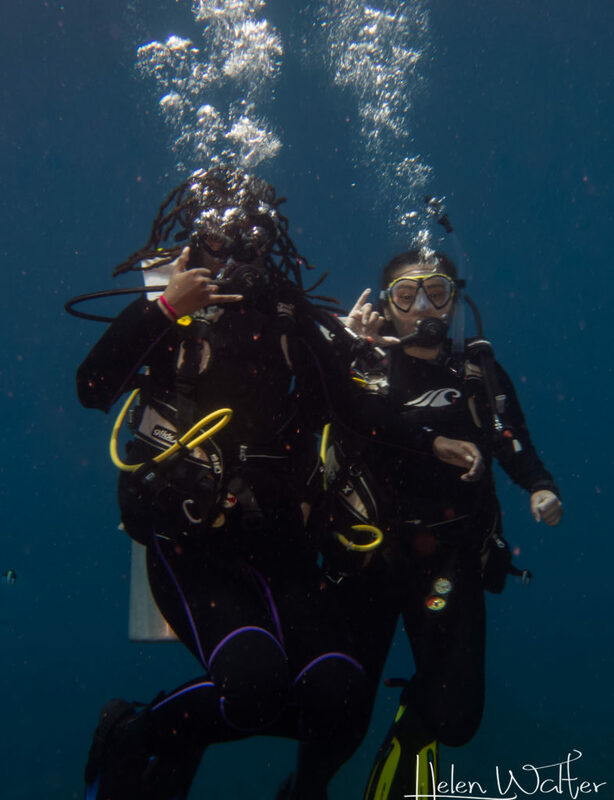 Our second dive was at Barry’s Reef. A site with beautiful topography. As you can see below there is tremendous diversity on the reef. This is one of the beautiful walls here in Roatan. You can see the diversity in this photo. 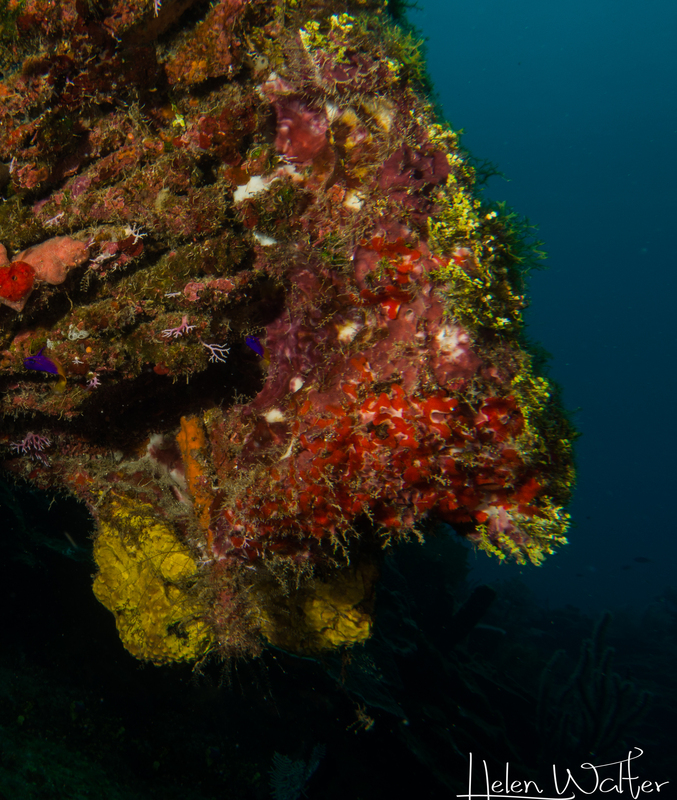 We also saw several Scorpion fish on this dive. 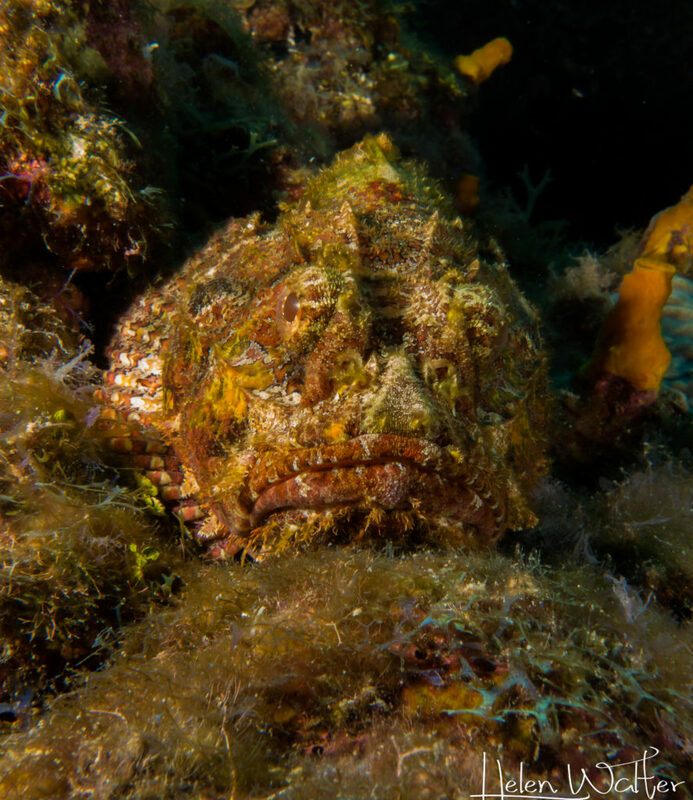 Scorpionfish always look so sad but are very poisonous. You should never put your hand on one, which is difficult because they camouflage so well! I’ve made him a little larger so you can see, but he blends in with the reef. He definitely got up close and personal. The camera didn’t want to focus he was that close. Overall our students did much better with their diving skills than yesterday. Every evening we spend time giving them feedback and encouraging them to think about what they can improve on, and how can we support this! End of the dive! Khallayla and Heily .. I think they liked it! Our lectures today were on coral restoration and reef monitoring. We learned how scientists use transects to understand how the reef is coping with the various stresses. We learned about the many transect methods including line, point, chain and belt intercept. Tomorrow the students will get to try belt intersect! We also learned about other methods, such as the manta tow, and Quadrat method. We also learned how coral restoration is accomplished. We learned how they are growing Staghorn and Elkhorn, we also learned that this year RIMS will start a massive coral growth. These massive corals grow slower, but someone has worked out how to speed them up! We also learned more about other plans they have including genotyping their species, and more coral trees, which we will be helping with. 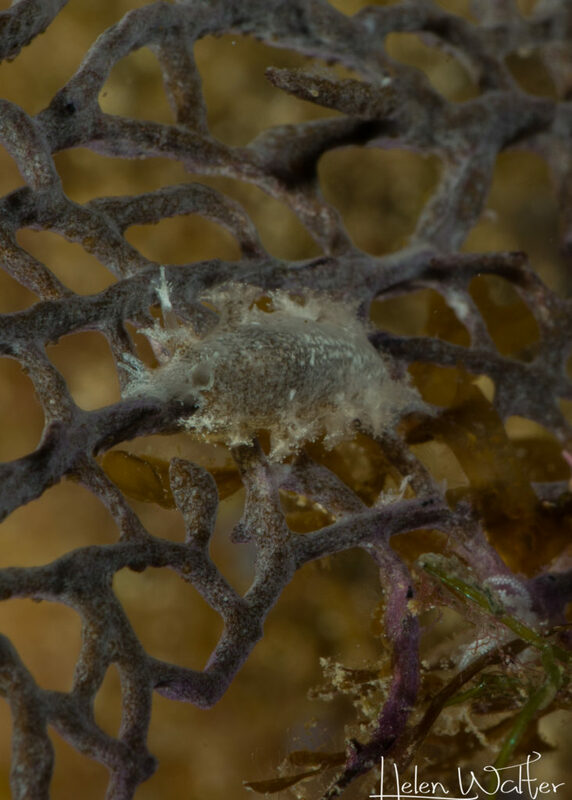 This is a tufted nudibrach. It is approximately 2cm or just under 1″ long. After dinner community time including going over the dives we’d done today, filling out logbooks and then game time with Pictionary. My team didn’t win, but we were pretty close. Previous: Previous post: Monday: Last One In Is..